Arguably one of the most classic Wyandottes ever to be! 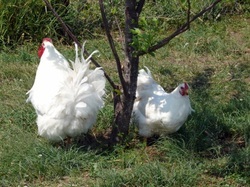 Our white wyandottes are a quite docile breed that are not flighty and very friendly. They make a beautiful addition to the back yard flock. They are extremely fluffy and seriously gorgeous. They lay a larger white/cream coloured plump egg. Eggs will be available this season!